“The new LAO forecast shows that California is well positioned to turn the corner on a decade of severe budget challenges and begin reinvesting in areas that are critical to our state’s economy and to the health and general well-being of communities statewide. Due in part to the new revenues approved by California voters earlier this month, the state has an opportunity to restore balance to the budget and begin rebuilding its key public systems and programs. “But even with this brighter outlook, it’s important to remember that many years of deep spending cuts have hit virtually all areas of the budget, from education to health care. With our state just starting to recover from the Great Recession and many families still feeling the effects of the downturn, we need to provide a strong safety net and ensure sufficient funding for key services and supports — such as child care — for individuals struggling to find and retain work. “The LAO’s new forecast underscores the fiscal challenges that California continues to face. The outlook suggests that revenues will lag the optimistic forecasts used as the basis of the 2011-12 spending plan and that shortfalls will persist absent significant additional revenues. Unemployment remains stubbornly high, both nationally and here in California, and state and local government job losses are weakening overall job growth. “The LAO’s report provides a first look at the state’s fiscal outlook for the remainder of this year and beyond. It is important to note, however, that due to the timing of certain personal income tax payments, policymakers lack critical information needed to develop an accurate picture of the state’s fiscal situation. Still, the budget shortfalls forecast by the LAO highlight the need for policymakers to take a balanced approach to addressing the state’s ongoing budget gaps. Without additional revenues, policymakers will be forced to make even deeper cuts to our public schools and universities and other public structures that underpin a strong economy and are essential to the lives of Californians. The LAO’s report highlights the importance of true prison reform. Recent budget agreements have included appropriate reductions in prison spending, however the Legislature has failed to enact the policy changes needed to enable California to significantly reduce growth in corrections and achieve targeted savings. It is also clear that California cannot continue to cut taxes for the state’s largest and most profitable corporations and balance its budgets. Every dollar lost to recent tax cuts reduces support for education and other public structures essential to the state’s economic future. With the next budget crisis looming on the horizon, regardless of the outcome of the May election, budgeteers are anxiously turning their attention to the daily cash count out at the Franchise Tax Board (FTB). FTB staffers are busily tearing open envelopes and counting cash to determine just how big the actual shortfall will be. Once the purview of Capitol insiders, the State Controller now posts the daily cash count, along with a comparison to the 2008 tax filing season, on his website. The Legislative Analyst ‘s Office (LAO) projects that revenues will fall short of the projections used for the February budget agreement by $8 billion. April tax collections will play a major role in determining whether the LAO’s estimates overshoot or undershoot the actual shortfall. Heading into the all-important month of April, 2008-09 revenues collections were $737 million (1.3 percent) below estimates used for the February budget agreement. 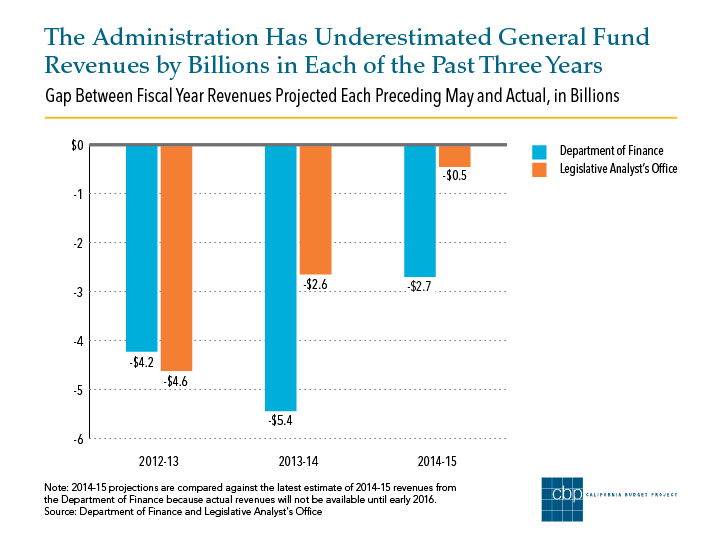 Most – $647 million – of the shortfall was due to lower-than-anticipated sales tax collections. Corporate income tax collections also lagged projections, while personal income tax collections were right on target for the year-to-date. The weakness in revenue collections reflects the continued economic downturn, including rising unemployment, falling new home construction, and sagging retail sales.